Yes, those are hand turkeys. They by choice made hand turkeys, and they had a blast. Thankfully, this surprise gave me an important reminder: even though they’re “big kids,” they still like to celebrate. The joy that simple assignment created got me thinking about fun ways to celebrate this holiday season leading up to winter break, so I joined up with some of my teacher-blogger friends to share ideas for creating comfort and joy in your classroom this holiday season. 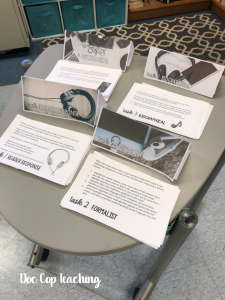 Today, I’m sharing four fun ideas that not only will spread joy but also provide meaningful engagement for your higher schoolers so they can have fun and learn too. We’ve had a lot of laughs over this little guy, but we also have a really important and engaging lesson on his behalf! I start the lesson with a bellringer that reads, “What do you think about ICT (Information and Communication Technology) surveillance? Is it a necessary evil? Explain.” I know this doesn’t really sound festive, but this is how I hook them. 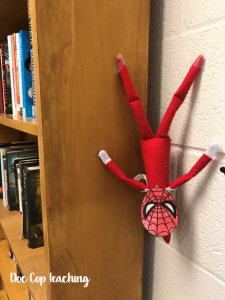 Once they’ve completed their bellringers, I introduce students to the article, “The Elf on the Shelf is preparing your child to live in a future police state, professor warns” by Peter Holley of the Washington Post. We read this article as a way to generate discussion and analyze the strength of the author’s claims. This piece always generates a lively discussion about Michel Foucault (hence the name, get it? ), Jeremy Bentham’s Panopticon, and their own holiday traditions. You can access a free copy of my article discussion questions in my VIP Resource Library. 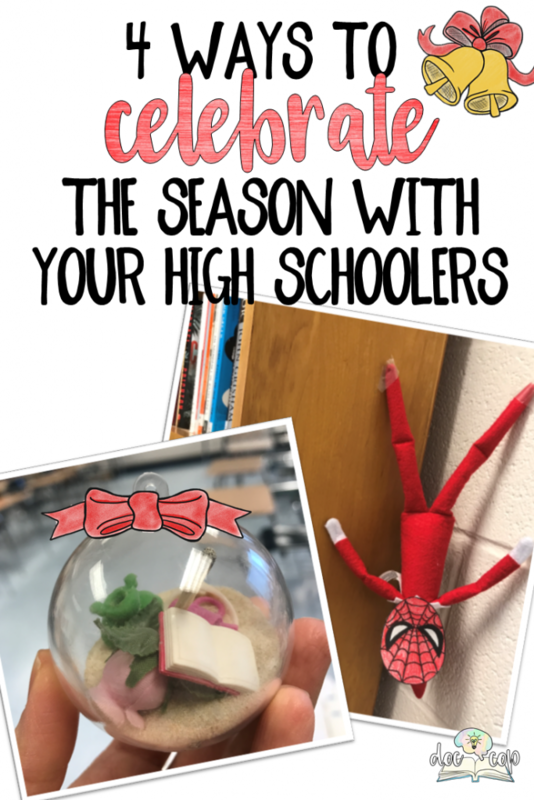 After this hearty discussion, our classroom mascot takes on a fun reminder of the lesson all throughout the holiday season. Plus, every day, the students come into class eager to see what mischief our little friend got into today. *TIP: Choose students to set up your classroom mascot each day, so you don’t have to spend time doing it. They love doing it, and they can find tons of good ideas on Instagram and Pinterest. You can even use this as a competition for creativity. Holiday music is a must if you want to get everyone in the holiday spirit. You really don’t need an excuse to play holiday music, but if you’d like a lesson out of it, have students analyze a holiday song of their choice. Many of these songs have interesting origins and meanings, which make them great for reader response activities. I use a Critical Reader’s Song Analysis. Also, check out this awesome (and appropriate) holiday classroom playlist from my teacher-friend, @maniacsinthemiddle. 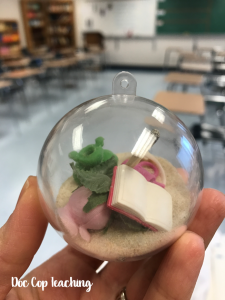 Depending on how many students you have, you can purchase plastic see-through ornaments and ask students to fill it with symbols that represent a literary work, a character, or even themselves. Use them to decorate your classroom tree or hang them throughout the classroom. Similarly, you could have students create their own paper ornaments with images to represent the symbols. Lastly, they could create their symbolism ornament digitally with a Google Slide. Students can search for images and drag and drop them into shapes to create a digital ornament. You can even print them and hang them around the room. If your students are like mine, they’ll embrace any chance to play a game in class. This is when we have to get a little creative so that we can play a game that has some educational merit. My favorite holiday game is charades, which in itself can have literary merit if you play with literary topics. As an introduction to this game, we do an impromptu speaking mini-unit that I call Snowy Speaking. After they practice impromptu speaking strategies with a small group and fun winter topics, charades sounds pretty easy. Sometimes, they even request to do impromptu speeches instead. If your students are into trivia games, Kahoot has some great pre-made holiday trivia games. Students can use any device to play the game while they compete against each other (and maybe even you) to answer quickly and accurately. Kahoot is always a hit with my students. Check this blog post for holiday gift ideas for your high schoolers! Don’t forget to check out all of the great ideas for adding comfort and joy to your classroom this holiday season and make sure you enter the 12 Days of December giveaway below!